As Chelsea were sipping the champagne of victory Fulham were wondering how they failed to win a match they controlled. It was Fulham's weakness in attack, the main reason they are battling against relegation, which cost them dearly again. In Jimmy Floyd Hasselbaink and Eidur Gudjohnsen Chelsea have a 51-goal partnership yet it was defender Terry, who won a winners' medal in 2000 as an unused substitute, who decided the outcome, though his effort was touched over the line by Louis Saha. David O'Leary, the Leeds manager, might have allowed himself a tipple last night because this result helps his club's European chances. With Arsenal Champions League-bound, Chelsea are guaranteed a place in the UEFA Cup win or lose which means if Leeds finish one place below the Blues they, too, will be in the UEFA Cup. Fulham were on the defensive even before the kick-off when chairman Mohamed Fayed needed protection against pieces of celery thrown into the directors' box by Chelsea supporters. Two muscular security men stood behind Fayed to protect him from the flying food. It is a Chelsea tradition to wave sticks of celery and chant the name of the vegetable, which is acceptable if a little unusual. However, a tossed salad is not so appetising when it arrives in such a manner. Chelsea left-back Graeme Le Saux, playing in his first FA Cup semi-final, had to leave the action soon after the last piece of celery was cleared. Le Saux, who later reappeared in the dugout on crutches, pulled up in the fourth minute with a calf injury and was replaced by Albert Ferrer, leaving only four English players involved in the tie. One of those, Terry, almost gave the Blues a 13th-minute lead with a half-volley which Edwin van der Sar tipped for a corner. The opening 20 minutes were more frantic than fluid, with both sides giving the ball away cheaply. Fulham had the better of the first half but both sets of strikers were hindered by poor service. Chelsea's wingers, Mario Stanic and Jesper Gronkjaer, were peripheral players, unable to make an impression on the game so the Blues were forced to play hopeful long passes down the middle which the Fulham defence easily coped with. The best move of the game so far came in the 29th minute when Sylvain Legwinski ran 25 yards with the ball, played a one-two with Steve Marlet and tested Carlo Cudicini with a well-struck shot from just inside the penalty area. The Chelsea goalkeeper, who boasted six clean sheets in his previous eight matches, was equal to the challenge. 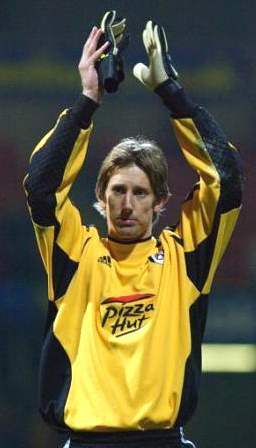 His counterpart, Van der Sar, had looked less secure under pressure but produced a fine save after Stanic had belatedly joined in the action, beating Andy Melville and John Collins. The Dutchman pushed Stanic's effort over the bye-line but then made a mess from Hasselbaink's corner kick. Despite being 6ft 7in Van der Sar was nowhere near the ball which struck Mario Melchoit and broke to Terry. The Chelsea defender stabbed the ball goalwards and while the last touch was Saha's Terry will undoubtedly claim the goal as the ball seemed to be going over the line. What proved to be the winner was against the run of play and it typified the generally scrappy nature of the tie. Despite falling behind Fulham continued to have the better of the match and came close to equalising in the 55th minute when Saha broke through. Cudicini made a one-handed save and from the corner the ball broke to Steed Malbranque on the left. Instead of chipping the ball into the goalmouth where a number of Fulham players were stationed Malbranque went for glory and as his shot sailed into the Holte End his team-mates did not hide their frustration. Gudjohnsen struck the inside of an upright in the 67th minute with a cross that became a good shot but it was a rare moment of concern for Fulham.